The M18 FUEL 7 inch / 9 inch Large Angle Grinder is the world's first 18v LAG delivering the power of a 15A corded large angle grinder, is up to 2LBS lighter, and has 9 inch grinding capacity. Providing high performance, advanced ergonomics & legendary durability, this grinder is designed to complete the toughest grinding, surface preparation, and cutting applications with any 7 inch - 9 inch accessory. The POWERSTATE Brushless Motor provides 6,600 RPM and higher speeds under load for corded grinding/cutting performance. REDLINK PLUS intelligence ensures maximum performance and protection from overload, overheating and over discharge. The M18 REDLITHIUM High Output HD12.0 battery delivers unmatched run-time in all applications. Tool-free accessory changes using the FIXTEC nut and guard adjustments mean less downtime during work. 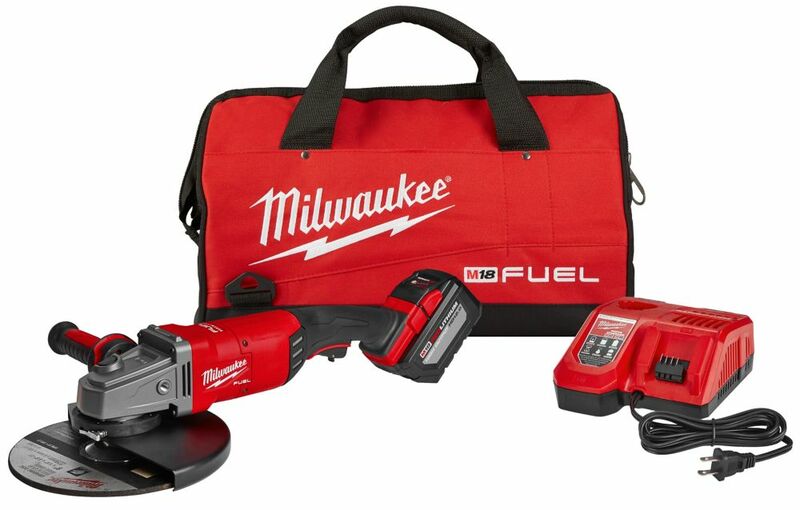 Includes: M18 FUEL Large Angle Grinder, (1) REDLITHIUM High Output HD12.0 battery, M18 Rapid Charger. The 20V MAX Cordless Die Grinder is brushless for a longer motor life and no needed brush changes. Fully control its speed with the variable-speed rocker switch so you have what you need for the job. Plus, you can choose from multiple grasps thanks to its dual-position rocker switch. M18 FUEL 18V Lithium-Ion Brushless Cordless 7/9-Inch Grinder Kit W/ (1) 12.0Ah Battery, Bag & Rapid Charger The M18 FUEL 7 inch / 9 inch Large Angle Grinder is the world's first 18v LAG delivering the power of a 15A corded large angle grinder, is up to 2LBS lighter, and has 9 inch grinding capacity. Providing high performance, advanced ergonomics & legendary durability, this grinder is designed to complete the toughest grinding, surface preparation, and cutting applications with any 7 inch - 9 inch accessory. The POWERSTATE Brushless Motor provides 6,600 RPM and higher speeds under load for corded grinding/cutting performance. REDLINK PLUS intelligence ensures maximum performance and protection from overload, overheating and over discharge. The M18 REDLITHIUM High Output HD12.0 battery delivers unmatched run-time in all applications. Tool-free accessory changes using the FIXTEC nut and guard adjustments mean less downtime during work. M18 FUEL 18V Lithium-Ion Brushless Cordless 7/9-Inch Grinder Kit W/ (1) 12.0Ah Battery, Bag & Rapid Charger is rated 5.0 out of 5 by 15. Rated 5 out of 5 by MAC from AMAZING!!!... AMAZING!! !